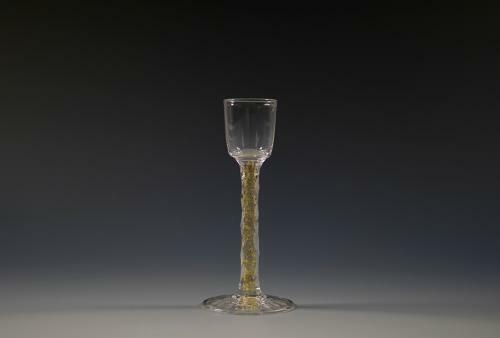 Rare liqueur glass with facet stem, gold foil optical ribbing and folded foot. Designed by Harry Powell and made by James Powell and Sons Whitefriars London c1900. Condition: Very good with no chips or cracks or restoration. Note: For a design drawing of this glass see: Whitefriars Glass James Powell & Sons of London by Wendy Evans, Catherine Ross & Alex Werner 1995. p.269, Plate 400.